Master Baiter Ace Card took his wife and friends fishing this morning along the New Hampshire Coastline. Coming from Dearing NH they arrived on the coast at 4am to start their day. Having a 6;30 high tide was a nice motivator into getting up early and heading to the ocean. 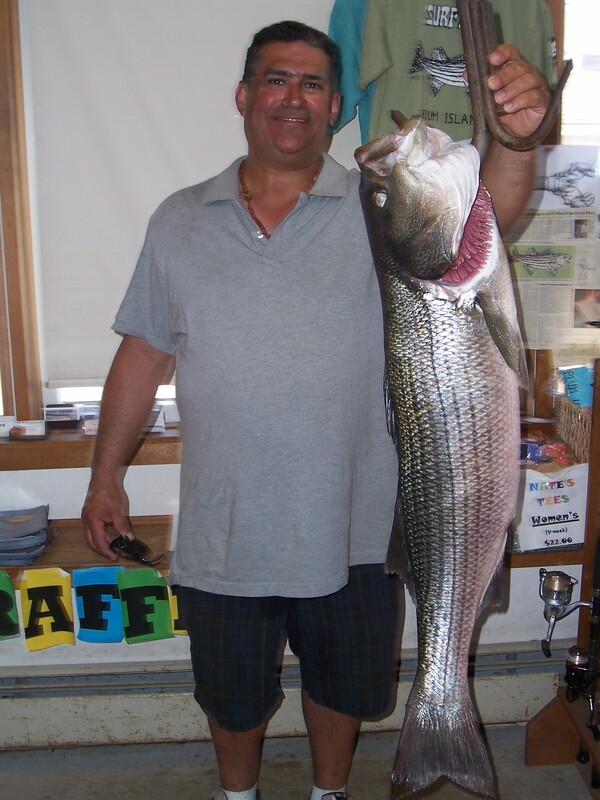 They caught 2 small stripers right off, a 16″ and a 20″. Then just before the high tide, Robin Card hooked into this Whopper using a chunk of mackerel. 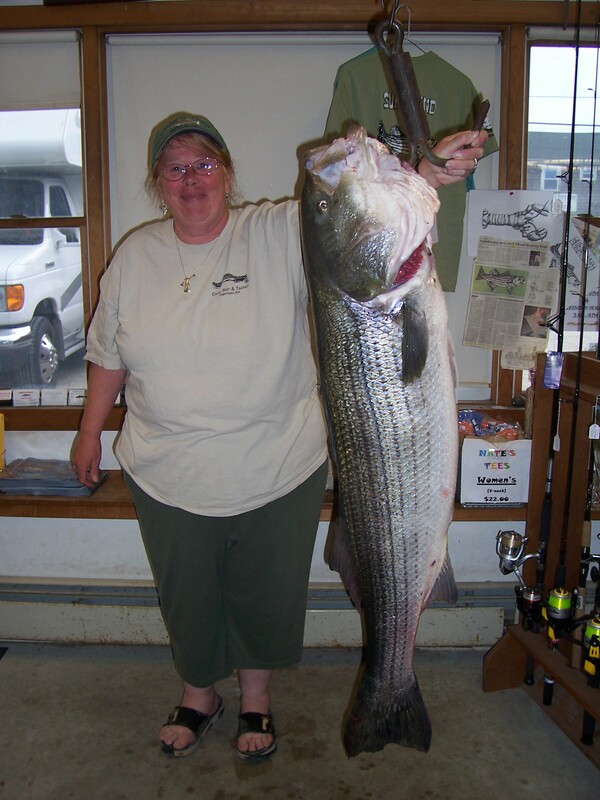 This fish weighed in at 43-8 lbs and mesured 50 inches long. What’s the saying???? “Girls Rule Boys Drool”??? Well boys……….bet you are drooling now!!!!!!!! The Greenheads are here, the heat is unbearable (even here on the island), and the fishing has been a bit on the slow side. But, there are fish here. They have a lot of food to choose from right now, they get a bit sluggish (like us) in this weather, but isn’t a day on the ebach better then __________? The greenheads will be gone soon (we are on the down swing of these little beasties). The refugee has opened up the end of the island, maybe, hopefully, more soon, and the heat is supposed to break today. GO FISHING! 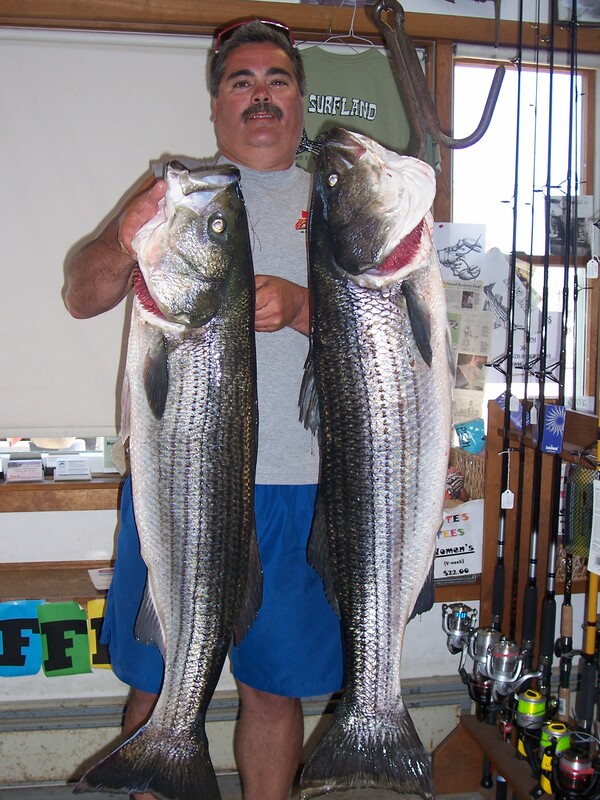 One of the local members of The Plum Island Surfcasters, Dave Sunman from Newbury, weighed in these two beauties that he caught from his boat live lining mackerel off Rockport. these fish weighed in at 32-7 and 28-7 lbs. 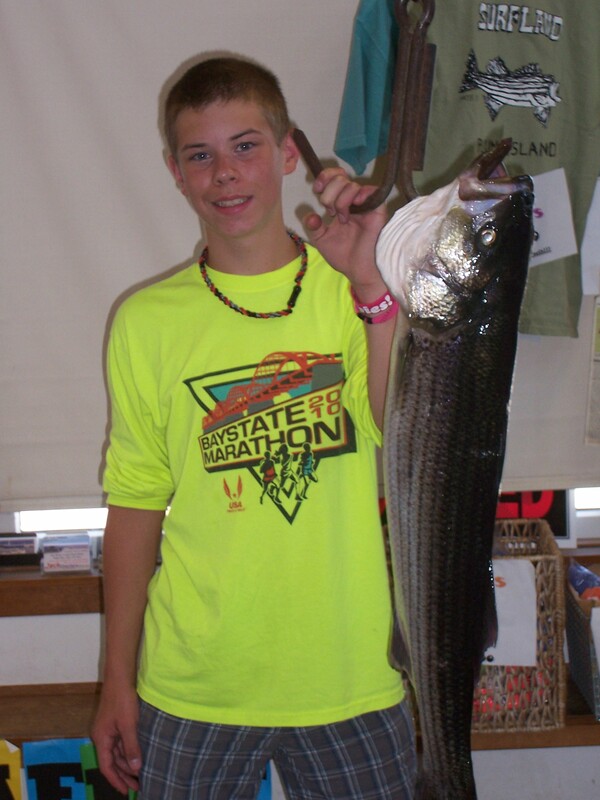 Zach Casper from Chelmsford also caught his fish from a boat. A 14 pounder using a bucktail jig! And Angel Conception from Lawrence caught his 21 pounder from the surf down at the jetty area of the Merrimac River using mackerel. Am I the only one who didn’t catch squat this weekend?? Seemed like an awful lot of baitfish or sand eels around.